TREASURE! 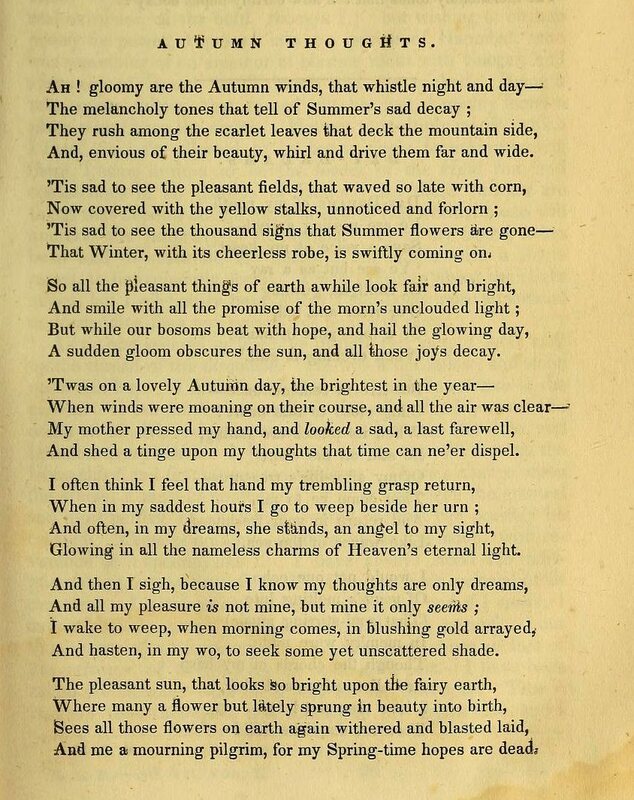 This poem, published at the end of the fall season, takes an unusual approach to the beauty of the New England autumn. To this author, autumn represents “Summer’s sad decay,” as “Winter, with its cheerless robe, is swiftly coming on.” The imagery is quite moving, especially the scene when the author remembers the passing of his mother as she looked one last time at the beauty of an autumn day. What makes this poem most notable is the way it blends the natural and the spiritual while avoiding any easy affirmation. As “heaven’s eternal light” shines, so too do the “Summer flowers,” but for the speaker all these hopeful visions fade into mere appearances, “only dreams” swept away by autumn winds. This poem’s intensity lies in the power of its emotion: its sincere, raw grief allows the reader to feel a private connection with the speaker, an intimacy often lacking in religious poetry of the time. Turkey! Not all unusual poems are effective. This weepy lament irritates in at least two ways: it ignores the sheer beauty of the season expressed in color, light, and movement and then it misses the significance of the very seasonal changes it deplores. Flowers do, undoubtedly, bloom in the spring and summer and then die in the fall. But, unless the speaker plants only annuals in his garden, when autumn gives way to winter, and winter gives way to another spring, new blooms, as Gilbert and Sullivan observed, will revive that “tra-la-la” feeling. Beyond this, the speaker has an unconvincing habit of quantifying his observations. His mother died on the “brightest” autumn day, not the second or third brightest; the season reminds him, not of a great many, but of no more nor less than “ten thousand” distressing memories. No wonder his pleasant dreams fade: he spends all his time counting his miseries! And, envious of their beauty, whirl and drive them far and wide. That Winter, with its cheerless robe, is swiftly coming on. A sudden gloom obscures the sun, and all those joys decay. And shed a tinge upon my thoughts that time can ne’er dispel. Glowing in all the nameless charms of Heaven’s eternal light. And hasten, in my wo, to seek some yet unscattered shade. And me a mourning pilgrim, for my Spring-time hopes are dead. Oh! if ye stay, I would my breast were hardened into steel! The melancholy tones that tell how earthly hopes decay!